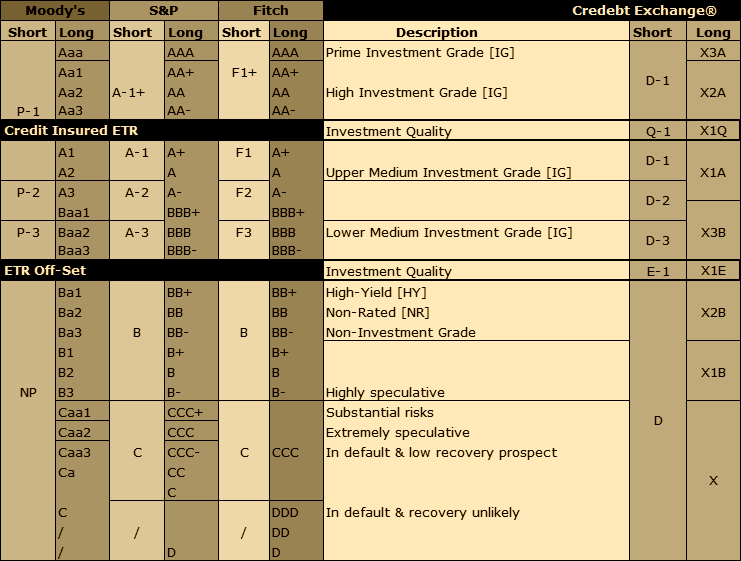 The following table explains the Credebt Exchange Equivalent Ratings used to grade ETR on the Exchange. Credebt Exchange Equivalent Ratings are updated on a regular basis and should be used as a reference only. Investors using Equivalent Ratings agree to be bound by the terms of the Master Agreement should understand how they are generated. Investors should also read the disclaimer below before considering Credebt Exchange Equivalent Ratings as part of your investment assessment. These equivalent ratings are not a recommendation or opinion that is intended to substitute for a financial adviser’s or investor’s independent assessment of whether to bid or buy on Credebt Exchange. The Credebt Exchange equivalent rating is derived from public information about the relevant entity. This information and the Credebt Exchange Equivalent Ratings are not necessarily accurate and correct at the time of viewing the rating. The Credebt Exchange Equivalent Ratings are a reference source only and should be used in conjunction with other information in forming the basis for an investment decision. Credebt Exchange Equivalent Ratings are based on reliable data and information, but Credebt Exchange has not verified this or obtained an independent verification to this effect. Credebt Exchange provides no guarantee with respect to the accuracy or completeness of the data relied upon, nor the conclusions derived from the data. Each Credebt Exchange Equivalent Rating is a relative, probabilistic assessment of the credit risk of the relevant entity and its potential to meet financial obligations. It is not a statement that default will or will not occur given that circumstances change and management can adopt new strategies. Credebt Exchange Equivalent Ratings are provided to the subscribers to our service only and neither Credebt Exchange nor any of our employees accept any responsibility on any ground whatsoever, including liability in negligence, to any other person. Finally and in accordance with the Credebt Exchange Master Agreement: Credebt Exchange may, from time to time, provide Equivalent Ratings in respect of Members or Debtors or enter into agreements with one or more Rating Agencies or Credit Reporting Agencies or other third-party service providers or contractors for the provision of Ratings or Credit Reports in respect of Members or Debtors. Credebt Exchange shall not be liable for the accuracy, completeness, availability and up-to-date nature of any Ratings, Equivalent Ratings or Credit Reports or any other data or information obtained from any Credit Reporting Agency or any other third parties. Each Member agrees to indemnify, defend and hold Credebt Exchange, its parents, subsidiaries, affiliates, officers and employees harmless from any loss, cost, damage, claim or demand, including reasonable legal fees, made by any third party or incurred or suffered by Credebt Exchange or its parents, subsidiaries, affiliates, officers or employees in connection with the Member’s use of any Ratings, Equivalent Ratings or Credit Reports in breach of the Master Agreement. Credebt Exchange may, from time to time, provide Equivalent Ratings in respect of Members or Debtors or enter into agreements with one or more Rating Agencies or Credit Reporting Agencies or other third party service providers or contractors for the provision of Ratings or Credit Reports in respect of Members or Debtors. Credebt Exchange shall not be liable for the accuracy, completeness, availability and up-to-date nature of any Ratings, Equivalent Ratings or Credit Reports or any other data or information obtained from any Credit Reporting Agency or any other third parties. Each Member agrees to indemnify, defend and hold Credebt Exchange, its parents, subsidiaries, affiliates, officers and employees harmless from any loss, cost, damage, claim or demand, including reasonable legal fees, made by any third party or incurred or suffered by Credebt Exchange or its parents, subsidiaries, affiliates, officers or employees in connection with the Member’s use of any Ratings, Equivalent Ratings or Credit Reports in breach of the Master Agreement. The provision by Credebt Exchange of any Ratings, Equivalent Ratings or Credit Reports to Members is not intended to be used as the sole basis for any decision making and is based upon data which is provided by third parties, the accuracy of which it would not be possible for Credebt Exchange to guarantee. While Credebt Exchange aims always to maintain a quality fully operative service, the Ratings, Equivalent Ratings or Credit Reports and any third party services are nonetheless provided on an “as is”, as available basis without warranties of any kind, whether express or implied. Specifically, Credebt Exchange gives the Member no warranty or assurance about the contents of any Ratings, Equivalent Ratings or Credit Reports. While Credebt Exchange does endeavour to maintain the accuracy and the quality of any Ratings, Equivalent Ratings or Credit Reports, they may be incorrect or out of date. Therefore any use of any Ratings, Equivalent Ratings or Credit Reports is at the Member’s own risk. Credebt Exchange disclaims all liability in contract, negligence, for breach of duty, or under any indemnity or otherwise in connection with any Ratings, Equivalent Ratings or Credit Reports and third party services and shall not be liable for any indirect, or consequential loss. Credebt Exchange shall not be liable for the following types of financial loss, loss of profits, loss of earnings, loss of business or goodwill in addition to the following types of anticipated or incidental losses, loss of anticipated savings, increase in bad debt and failure to reduce bad debt. Where any matter gives rise to a valid claim against Credebt Exchange its liability shall be limited to a sum equal to the sum paid for the Ratings, Equivalent Ratings or Credit Reports supplied under this Agreement in the year the claim arises. Nothing in Section 7 or any other provision of the Master Agreement shall seek to exclude or limit liability for infringement, death, personal injury or fraudulent misrepresentation. Each Party to the Master Agreement warrants that it has obtained and will continue to hold all necessary licenses, consents, permits and agreements required for it to comply with its obligations under this Agreement and for the grant of rights to the other Party under this Agreement.